Well it’s not been the best of weeks for Margaret and I. Margaret started a cold on Saturday 5th but soldiered on in spite of all our post bird race guests. By Monday she was well enough to go to work but I had started a sore throat, she seemed to recover during the week as I got worse, but then by the following Friday (11th) I had largely recovered but she had markedly deteriorated and has been almost bed bound since. Although I have spent most of my adult life working with infectious micro-organisms I have suffered few serious respiratory infections. I have put this down to the fact that my immune system was being constantly challenged by the bugs at work and so was in a state of constant readiness. Maybe now that challenge has been removed I can look forwards to more colds and flu-like symptoms in the future (although reduced contact with infected people should help to mitigate this). At the age of 17 I made the decision that I wasn’t going to get the grades to be a medic, the career the headmaster had been pushing me towards, and it was my biology teacher, whom we nicknamed ‘Noddy’, who recommended Microbiology as a degree subject. I soon became fascinated with electron microscopy and the detection of viruses (although later found that EM work can be most boring). I used an EM whilst I was at Leeds and soon after I moved to Poole in 1978 one was installed there, however new techniques meant that you no longer had to look at viruses to detect and identify them and it soon became obsolete. Me working at an Electron Microscope in about 1974. The device is really just a modified TV. The electron beam is fired downwards. The specimen, stained with an electron opaque dye is placed in the apparatus just above my head and the image projected onto a screen below. 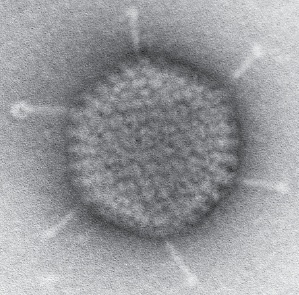 An electron micrograph of a single Adenovirus. A common cause of colds and respiratory infections. This virus is a masterpiece of design having 252 protein ‘capsomeres’ arranged into a perfect icosahedron. The diameter is about 60nm, ie 60 millionths of a millimeter. The protein spikes (6 visible here but 12 in total) can’t be much more than a nanometer (a millionth of a millimeter) in diameter and represent the limit of EM resolution. We certainly knew we had set the machine for optimum performance when we could see them. The 7th would have been the birthday of my first wife Janet. Although life has moved on, I will not let her memory fade and accordingly I visited her grave at the Parish Church. We were together for 30 years until her untimely and totally unexpected death in August 2004. Janet and I at our wedding in September 1976. 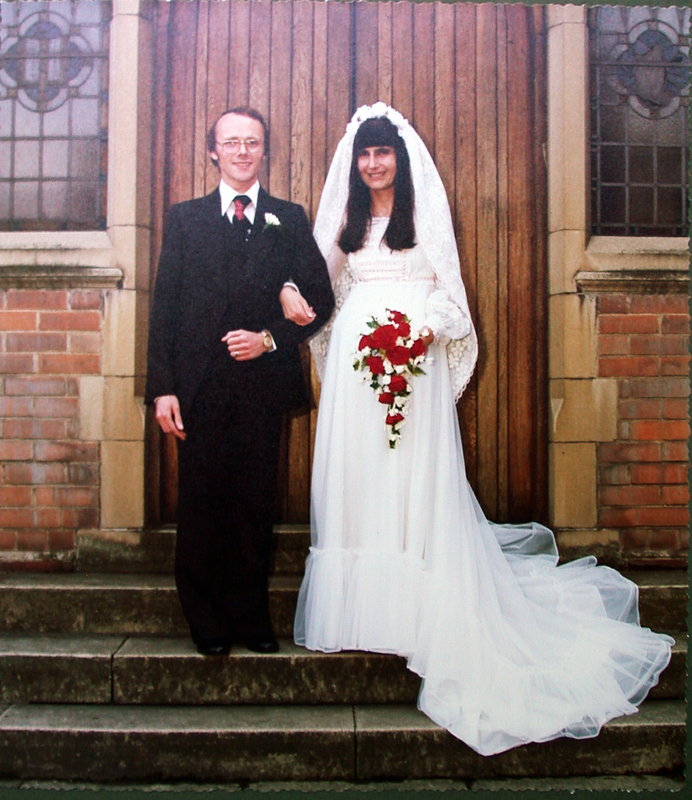 Although we lived in Leeds we opted to get married at her parent’s church in Long Eaton near Nottingham. Later in the day I was told by my friend Paul Moreton of a flock of Waxwings near his house in Lytchett Matravers. A quick visit showed there were 27 in the flock but it was grey and dull and conditions were far from ideal for photos. Although I saw a few from the current invasion in late 2012, this was my first sighting this year. Although it was very dull I was pleased with this shot as it shows the red waxy projections on the wing coverts that give the bird its name. After a suitable rest on Tuesday I had a number of commitments to honour on Wednesday. I had promised trainee ringers, Kevin and Sean that I would ring at Holton Lee. We have found in the past that unless we continue to ring birds away from the main migration periods and maintain activity during the winter, then trainees quickly lose the skills they have built up during the autumn. As I want to continue to monitor the birds visiting Holton Lee this lets us ‘kill two birds with one stone’ to use an inappropriate expression. As both are quite experienced I was able to sit back and take a supervisory role. We trapped 48 birds, two-thirds of which we had ringed before. The surprise, I suppose, was this Woodpigeon that blundered into the net. Although we see Woodpigeons migrating in huge numbers in November these local birds are most likely to be sedentary. My other commitment was to give a talk to the Bournemouth RSPB group on my three visits to New Guinea. 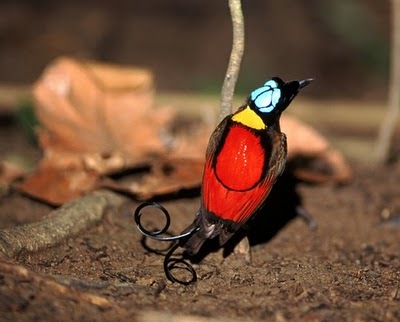 Somehow I croaked my way the talk, I felt it wasn’t the best slide show I had ever delivered but I was able to show that although New Guinea undoubtedly has the finest birds in the world, getting to see them can involve some hardship. 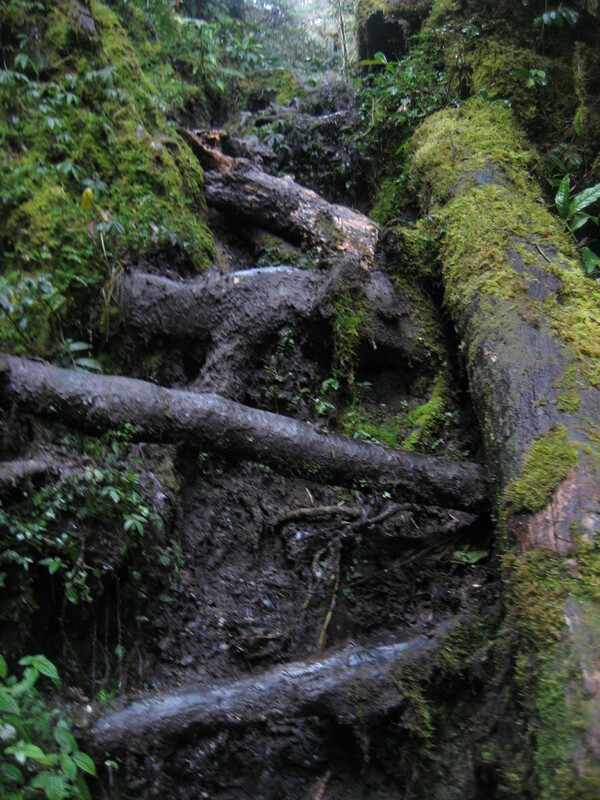 Undoubtedly the hardest of the three New Guinea trips that I have done is the one to the Indonesian province of West Papua, Trails like this over never-ending tree roots and through deep mud……. …. 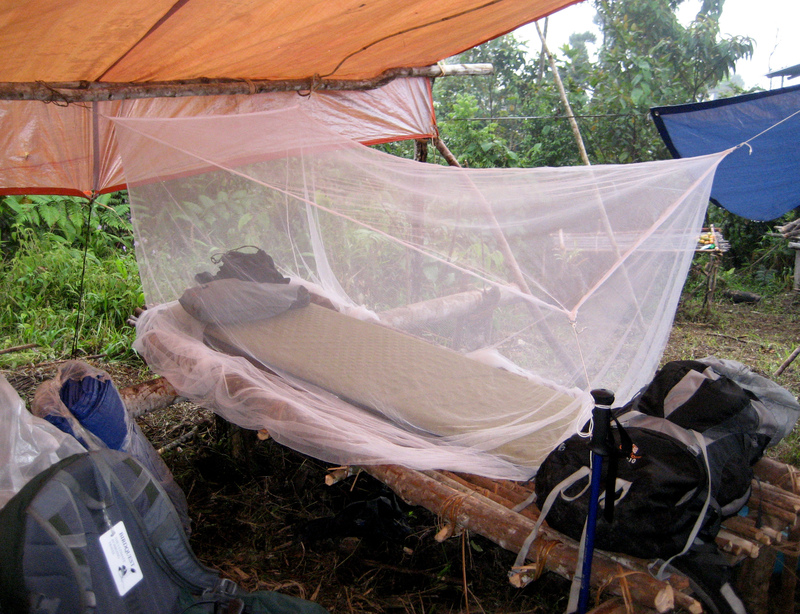 and accommodation like this ……. …. 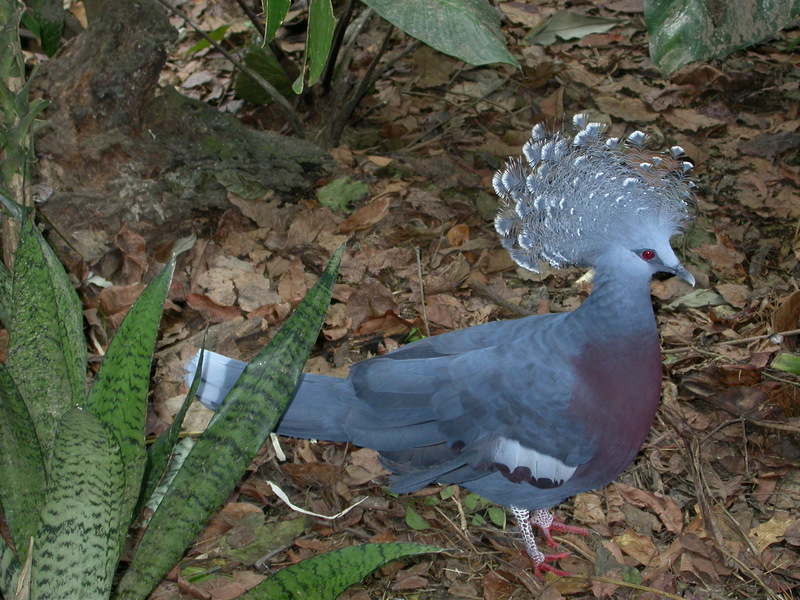 is obligatory if you are going to see gems like this turkey sized Victoria Crowned Pigeon …..
… or the best bird in the entire world, the unbelievable Wilson’s Bird-of-Paradise. (photo from the internet). « 2012 – a summary of my ‘big year’.